I love this book. Check out my spoiler-free review below. For existing More Than Series readers/fans: If you have the More series, you are already emotionally attached to Jay’s characters so there’s no need to even look at the synopsis of this book. Why bother? You know what you are getting yourself into and that you are about to embark on an emotional journey. Her stories have a way of embedding themselves in your heart and soul. I know a few fans that have tattoos with lines from Jay’s books. So there is nothing I can say to existing More fans. You are going to devour and treasure this book. Lucas is a spin-off from the More series. Who can forget the Preston brothers? This book is a true standalone, but existing fans will love the way Jay seamlessly tied everything together. I was about to compare Jay’s writing to Colleen Hoovers, and I remembered an old review I wrote in July 2013. I’ll just re-quote it. “More Than This by Jay McLean is one of those books that will stick with me forever…just like Colleen Hoover’s Slammed and Hopeless.” So buckle up and get ready for a rollercoaster ride of the feels in this emotionally gripping new book from Jay. 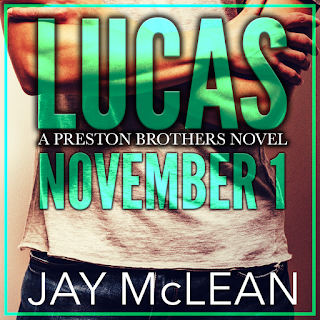 For new Jay McLean readers or if you're considering reading Lucas - See above. I think it says it all. Get this book. You might want to plan for a book hangover that will stay with you for a long time.